This a 600 sq. ft. Wildflower cabin in California. Outside, you’ll notice a standard gable roof with vertical green siding mixed with cedar shakes. A real brick fireplace stands on the side and from the front door you can walk onto a beautiful deck to enjoy the views of the trees. Walk inside and you’ll be surrounded by lodge-like features. Wide pine walls and floors along with a deer antler chandelier complement the burnt red sofas and fun tribal rug. An actual staircase leads up to the loft where you’ll find a white wainscoted daybed and a cozy sitting chair for reading on cool days. A wall separates the kitchen from the living area and inside you’ll find full-sized appliances, including a retro Wedgewood stove. The breakfast nook includes a pine table with four blue chairs that looks perfect for a vacation meal in the woods. All this for only $145 a night on Airbnb. Picturesque! Just lovely! Decorated beautifully; makes me want to move in! Thanks! Love this. I could live in this the rest of my life time and my four legged kids would even be happy. I’d be happy with about half the square footage for me and 3 four legged girls…very happy!!! I could move in tomorrow and not change a thing…..PERFECT! Peggy took the words right out of my mouth. Love it and it doesn’t have that cramped look that a lot of tiny houses have. Also, I love that old fashion stove. I rather have that then stainless steel. Why did they switch out the burnt orange sofas for ugly green sofas for the overhead shot? Also, is the blue table in the kitchen area or a different room? And how many bedrooms does this 600 sq ft home have in it? I saw a day bed in one section and a full size double bed in another section? Off of which bedroom is the bath? Why? Well as my old man used to say, a change is as good as a rest. Good enough reason for me. I love, love, love this house. It has everything I need or want in it, including a fireplace. Since I will be 70 this year, I am looking for a home big enough for my husband and me, plus our feline fur babies. This is a perfect space because it also has a downstairs bedroom and bath (I don’t do stairs anymore). Thank you for showing this house. I like the decor and layout of this, but am curious – I saw pine trees around it so that tells me it may not be in the warmest climate. I am wondering what is put in place to prevent heat loss as I didn’t see a ceiling fan, and there is no insulation in the ceiling? Also, the fireplace appears to be more for show and not to give off heat? 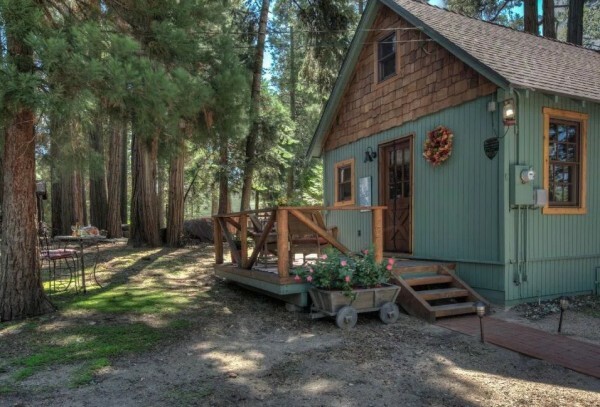 Or is this cute Air bnb dwelling simply for summertime rental use? Wow, this is darling, so warm and cozy and comfortable. Nice size. Charming retreat in a forest glade. I’m lovin’ it! Love this place and it is exactly want we want to build in Virginia. How can I get the plans for the cabin? Would love to see the floor plan for this home. Really great looking home. Wow, it looks bigger on the inside! It’s just beautiful. Does someone really live there? This looks professionally decorated. Thanks for sharing. this is my all time favorite one; color scheme, layout, and all! when we built our small home, we did the same thing in the kitchen; tucked a roll out butcher block beside the frig and when we need an “island” it’s there. Call me an ignorant newbie, but where does clothing go in these homes? Free-standing racks I understand, but wouldn’t they take up a lot of space? I love this house and the size, floor plan. I need to sell my tiny house so I can start over. Where should I post my house and pictures? Beautiful! First class. Would love to stay there for a vacation. It is so inviting. It’s everything I need 🙂 Except it’s not round…rats haha. Gorgeous, love all that wood and rustic look. Want this. BY FAR my very favorite. in the process of cleaning out my 12×24 ft log home shed adding on and building a tiny home. so much to clear out. bought a 10×16 shed don’t think it will all fit. feeling overwhelmed. Again, I am asking…when you show 600, 700 or whatever square feet, are you meaning the footprint (ground level) or the entire home? In real estate sales or appraisals, we consider the living area, above grade, as the size or gross living area of the home. I think you mean footprint.